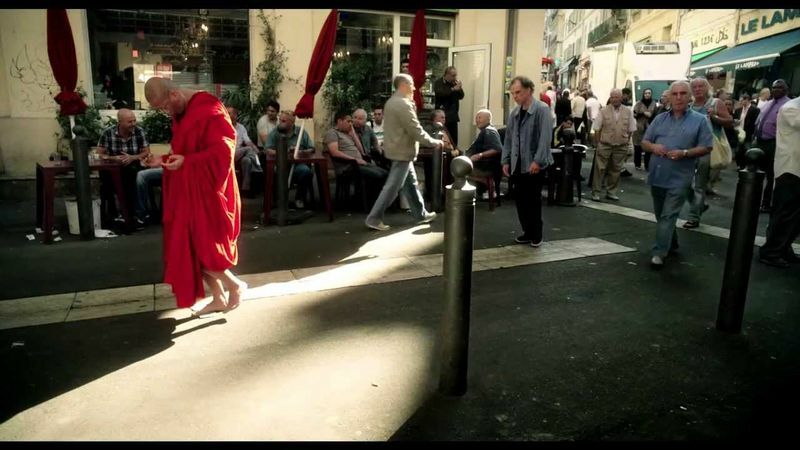 Loosely based on the classical Chinese story, this meditative piece follows a red-robed monk (Lee Kang-sheng) as he inches his way through the streets of Marseilles, France, in 14 meticulously composed shots. The famously cryptic director shuns a traditional narrative, instead taking the viewer on an enlightening path through increasingly complex scenes, from a sunlight stairwell to a busy café. As the monk trudges on with intense focus, onlookers watch with a variety of reactions, from curiosity to boredom, until one man (Denis Lavant) joins the pilgrimage. This 56-minute gem quietly comments on the art of leaving the quotidian grindstone for all-consuming spirituality. Journey to the West is an invitation to pause and to wonder at the inherent ethereal in everyday minutiae.